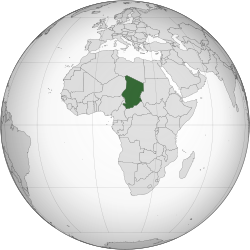 Chad (French: Tchad, Arabic: تشاد‎ Tshād), offeecially kent as the Republic o Chad, is a landlocked kintra in central Africae. It is bordered bi Libie tae the north, Sudan tae the east, the Central African Republic tae the sooth, Cameroon an Nigerie tae the soothwast, an Niger tae the wast. Due tae its distance frae the sea an its lairgely desert climate, the kintra is whiles referred tae as the "Deid Hert o Africae". Chad is dividit intae three major geographical regions: a desert zone in the north, an arid Sahelian belt in the centre an a mair fertile Sudanese savanna zone in the sooth. Lake Chad, efter which the kintra is named, is the lairgest wetland in Chad an the seicont lairgest in Africae. Chad's heichest peak is the Emi Koussi in the Sahara, an N'Djamena, (formerly Fort-Lamy), the caipital, is the lairgest ceety. Chad is hame tae ower 200 different ethnic an linguistic groups. Arabic an French are the offeecial leids. Islam an Christianity ar the maist widely practiced releegions. Beginnin in the 7t millennium BC, human populations muivit intae the Chadian basin in great nummers. Bi the end o the 1st millennium BC, a series o states an empires rose an fell in Chad's Sahelian strip, each focused on controllin the trans-Saharan trade routes that passed throu the region. Fraunce conquered the territory bi 1920 an incorporated it as pairt o French Equatorial Africae. In 1960 Chad obtained unthirldom unner the leadership o François Tombalbaye. Resentment towards his policies in the Muslim north culminatit in the eruption o a lang-lastin ceevil war in 1965. In 1979 the rebels conquered the caipital an put an end tae the sooth's hegemony. Housomeivver, the rebel commanders focht amangst thairsels till Hissène Habré defeatit his rivals. He wis owerthrown in 1990 bi his general Idriss Déby. Recently, the Darfur crisis in Sudan haes spilt ower the mairch an destabilised the naition, wi hunders o thoosans o Sudanese refugees livin in an aroond camps in eastren Chad. While mony poleetical parties are active, pouer lies firmly in the haunds o Preses Déby an his poleetical pairty, thei Patriotic Salvation Movement. Chad remains plagued bi poleetical veeolence an recurrent attemptit coups d'état. The kintra is ane o the poorest an maist corrupt kintras in the warld; maist Chadians live in poverty as subsistence herders an fermers. Syne 2003 crude ile haes acome the kintra's primary soorce o export earnings, supersedin the traditional cotton industry. ↑ "Le TCHAD en bref" (in French). INSEED. 22 July 2013. Retrieved 18 December 2015. ↑ Projections demographiques 2009–2050 Tome 1: Niveau national (PDF) (Report) (in French). INSEED. July 2014. p. 7. Retrieved 18 December 2015. ↑ DEUXIEME RECENSEMENT GENERAL DE LA POPULATION ET DE L'HABITAT (RGPH2, 2009): RESULTATS GLOBAUX DEFINITIFS (PDF) (Report) (in French). INSEED. March 2012. p. 7. Retrieved 18 December 2015. ↑ "Gini Index". World Bank. Retrieved 16 April 2017. Wikimedia Commons haes media relatit tae Chad.